We kicked off the pride festivities with a stop at Vienna’s Pride Village, where all the booths are with LGBT related information, free HIV testing, Austrian food, drinks, and even a small tent for performances. The day we arrived, however, was like when you’re the first one to arrive at a house party. Awkwardly empty. Still, we’re always willing to go where beer is being served. Especially gay beer. So we strolled through the tiny village of Pride and purchased ourselves an outrageously overpriced beer. It was a week day afternoon so I suppose it was understandable why it lacked in crowds. 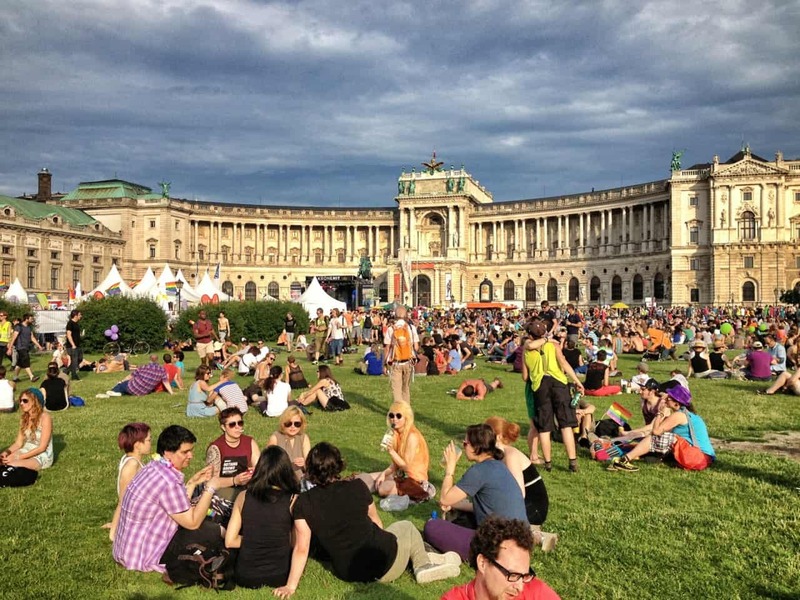 The best part about Vienna’s Pride Village is easily its location, centrally occupying Heldenplatz facing the Hofburg Palace. It provides a beautiful backdrop to the festivities and it’s fantastic to see groups of elderly Asian tourists accidentally stroll through the Pride event on their way to visit the palace. 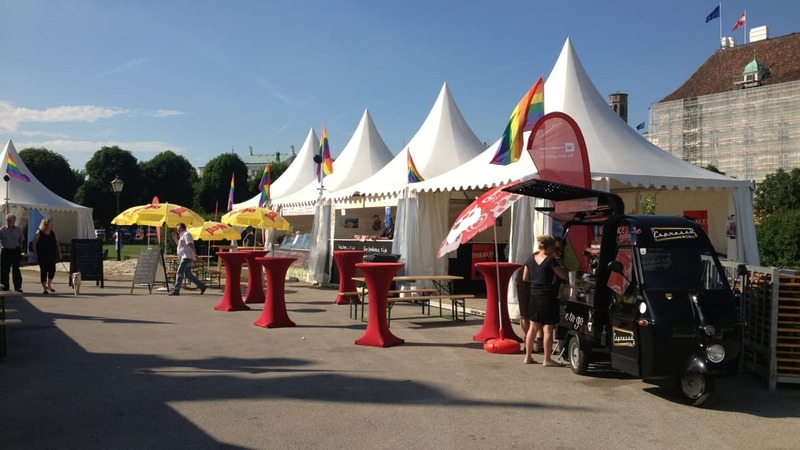 What must they have thought as they passed booths handing out free condoms, half naked bartenders serving up drinks, and rainbow colored souvenirs being sold at every corner as they made their way through Heldenplatz to do some traditional tourist sightseeing? 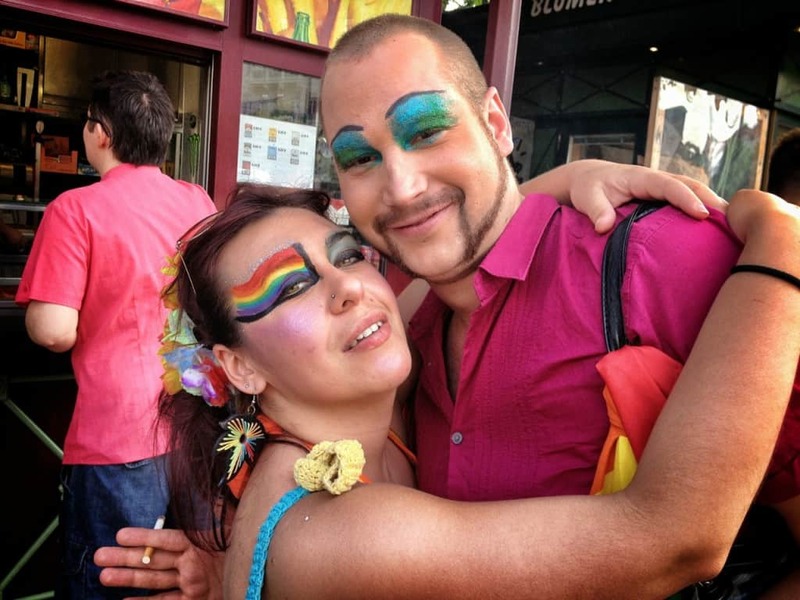 Saturday was the highlight of any gay pride, the parade or Rainbow Parade as it is in Vienna. Colorfully and creatively dressed pride marchers ambled between elaborate floats blaring music and carrying passengers dancing to the latest hits. Spectators enjoyed all the effort that was clearly put into the event. It was a diverse crowd of locals and tourists, young and old, gay and straight, children and adults. Everyone was enjoying the entertainment. 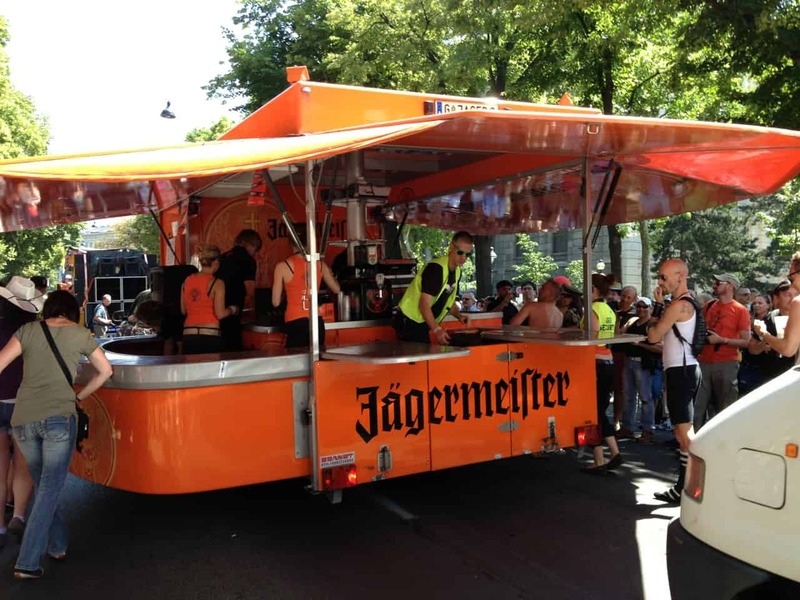 A new float concept for me that I’d not seen before was a mobile bar. Unlike other parades I’ve been to where there’s a gate or officials or both keeping the crowds from entering the parade route, European parades seem to welcome the onlookers in joining their path. In this case, they could even walk up to the moving bar float and order a drink – but not for cheap! After the parade finished snaking through the streets of Vienna, we followed the crowds back toward Heldenplatz where the celebration would continue and people would hop from booth to booth or lounge on the inviting expanses of lawn that the plaza offered. It was at this point that we met the Austrian doppelgänger of one of our friends back in the States. We had to get a picture with him and he kindly obliged. When he finished the last sip of the beer he was holding, tossed the can and pulled out another beer from his backpack stating, “I never like to be without a beer in my hand,” Auston and I knew we were going get along great with this guy. Vienna’s pride was one of the more enjoyable ones we’ve attended. The small Pride Village is more than supplemented by its central and historical location. The parade was elaborate and lively and the people were open and welcoming. It was a great event to add to our first Viennese experience. This was just the beginning of our summer pride touring in Europe, however, as we’ll be venturing to five total this summer. Yes, five! ‘Pride whores’ wasn’t an exaggeration. 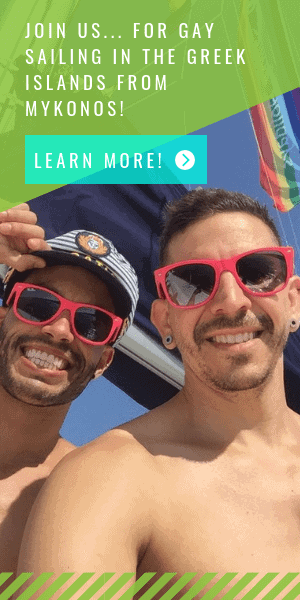 Did you attend any gay pride events near you this summer? If so, where? And what did you think of it? Share with us below!